The first new nuclear plant in 20 years is about to be turned on in the US, in Tennessee. At the same time the Tennessee Valley Authority starts up the 1400 megawatt Watts Bar Nuclear Plant (Unit 2), it is also looking to add an enormous amount renewable energy – 3.8 gigawatts (GW) of solar and 1.75 GW of wind by 2033. Over half of TVA’s energy will be zero emissions by 2020. With enough power for two cities the size of Chattanooga, Watts Bar 2 will replace closing coal-fired plants. But the plant was designed in the 1960s and has been under construction since 1972! It was put on hold during the 1980s and revived in 2007, with the cost almost doubling from $2.5 billion to $4.7 billion. 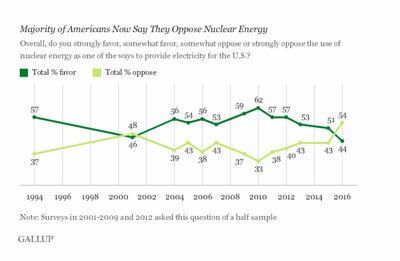 A recent Gallop poll finds that, for the first time, a majority of Americans oppose nuclear energy (54%), up from 43% a year ago. Asked every year as part of an environmental survey, 62% favored nuclear in 2010. Even after the Fukushima meltdown in 2011, attitudes didn’t change, leading Gallop to conclude that with low gas prices, Americans don’t feel the risk of nuclear is worth it. The industry has been plagued by cost-overruns and delays, and ratepayers have seen high utility bills, in addition to the dangers (and waste) nuclear plants pose. 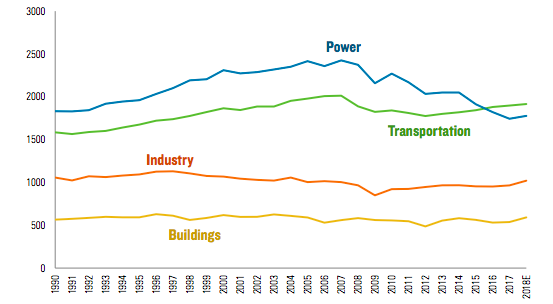 Worldwide, the use of nuclear energy peaked in 2006 (438 plants) after booming in the 1960s and 1970s. It supplied about 18% of electricity in 1996, dropping to 11% by 2013 with 388 plants, according to the World Nuclear Industry Status Report. Most are in the US (100 plants), followed by France (58), Russia (33) and South Korea, China, India, and Canada (each have 20). While Germany and other countries have abandoned nuclear, China plans to build 56 plants by 2020 and the UK is fighting over a $26 billion new plant. If all the plants under consideration are built, capacity will be 45% higher in 2035. “New nuclear power would be a real setback in terms of trying to solve the climate problem,” Mark Jacobson, the Stanford professor who maps how 100% renewable energy can be achieved. “Even if there were no issues like meltdown or waste proliferation – which are serious issues – it’s just so costly and it takes so long to put up new nuclear reactors that by the time the next set of nuclear reactors are planned, permitted, constructed, it takes 10-19 years. The Arctic ice will be gone,” he told Fast Company. Imagine how much renewable energy we could quickly install at those prices!! In the US, between cheap natural gas and renewable energy, it’s hard to see how nuclear makes sense. Lately, the low cost of electricity from wind and natural gas has been undercutting nuclear, but rather than fighting the fracking industry, the industry fights policies that support energy efficiency and renewables on the state and federal levels. Utility FirstEnergy was a major factor in Ohio’s suspension of its Efficiency and Renewable Portfolio Standards, for example, and has been pushing guaranteed rates for nuclear energy – at a cost of an extra $3.2 billion for ratepayers, reports Midwest Energy News. “Clearly FirstEnergy was seeing both energy efficiency and renewable energy as direct competitors. The arguments they were using were that these mandatory standards are distorting the market and are costly to ratepayers. But as soon as the standards were frozen, they turned around and proposed a plan that is looking to distort the market and going to cost $3 billion,” Allison Fisher of Public Citizen toldMidwest Energy News. While utilities have tiny stakes in renewables, they often have major investments in both gas and nuclear. Most of all, they don’t want a shift from centralized to distributed energy. That’s why we see them lobbying against tax incentives for renewables and against solar net metering. “Renewables and energy efficiency are options that are on a downward cost-curve, and when given the chance, prove themselves highly cost-effective. The major barrier to the take-up of these is the credulity of policy-makers to new, ever more unrealistic claims for new nuclear technologies and the self-interest of large utilities of promoting large technologies because they insulate them from competition from new dynamic companies,” says Stephen Thomas, Professor of Energy Policy at the UK’s University of Greenwich. Read our article, 1955: Why the US Chose Nuclear Energy Over Solar.